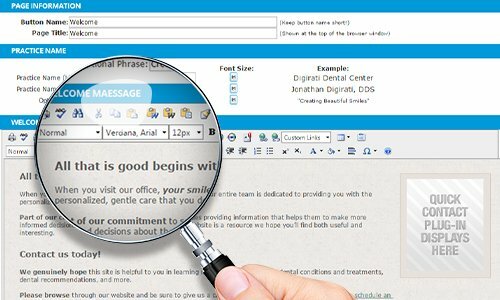 Keep your medical or dental practice’s website up-to-date. You have a practice to run, but a website that looks or feels obsolete creates the perception that you're behind the times, even unprofessional. With FutureNow Assurance™, you can be sure that your website’s content and design will always be current with whatever changes or trends may come. What Is Included With FutureNow Assurance? FutureNow Assurance allows you to easily update content and design on your website through our patented WebEngine Technology™ dashboard. No more costly website updates. No more waiting for your designer to implement changes to your site. Now, you can make changes yourself in just seconds with our trademarked content management system, part of FutureNow AssuranceTM. This system allows you to easily update staff information, add pictures, videos, change your design, and more. Even adding a brand new web page from scratch is as easy as writing in a Word document. Plus, you can preview your work before you publish it live on the Internet. Rather have us do it for you? No problem. You also get unlimited customer support from a friendly team with experience updating medical and dental websites. Your website is specifically designed to bring in new patients, but even the best looking websites need an update now and then. 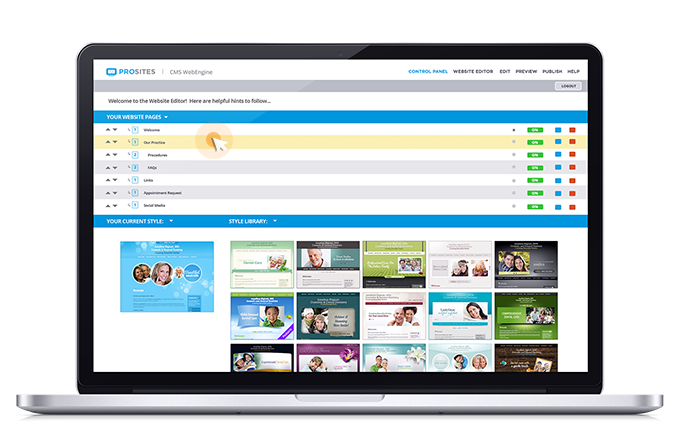 Your ProSites website will immediately set new patients at ease by showcasing your professionalism and projecting a caring, welcoming tone throughout the entire site. You have access to hundreds of pages of patient-focused content that will educate, answer frequently asked questions, prompt new inquiries, and alleviate patient anxiety. You regularly receive new medical or dental website designs in your library, the latest features, and back-end coding upgrades that keep your site running as effectively as possible, free of charge. In the last few years alone, we’ve released dozens of new designs and pages of content to keep your practice up-to-date. Static websites (i.e. most websites) are made up of a collection of files that remain unchanged and become outdated without constant modifications. Since this is very time consuming, and costly, our competitors simply won’t do it. Keeping pace with the ever-changing Internet is essential to keep websites for dentists and doctors performing at their best. That’s why ProSites introduced the first database-driven WebEngine Technology™ specifically for dental and medical industries. Our database-driven websites are dynamic and can be easily updated, saving both time and money. 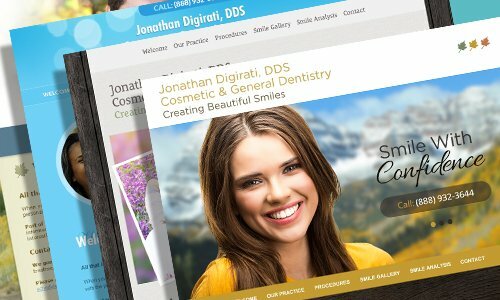 While you’re busy running your dental practice, we’re busy focusing on new upgrades, and developing releases that keep your website cutting-edge. Bottom line: database-driven websites save time, which saves you money. When new browser updates emerge, most design firms simply don’t have time to look at individual websites to ensure they’re optimized within the new browser. With ProSites, we’re able to update all of our websites at once, so we can ensure your website is always looking it's best. Try It Free for 14 Days Right Now.